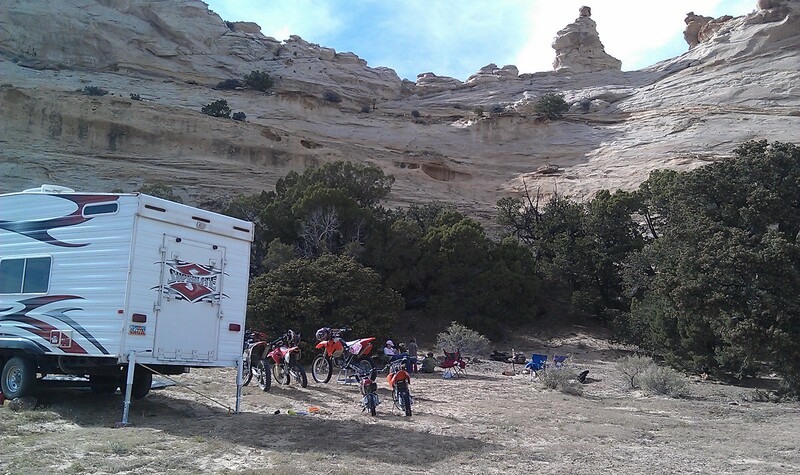 Another very popular loop in the San Rafael Swell, the Fixit Pass to Devil's Racetrack offers more great scenery that you would expect in the Swell along with a few challenging rock sections and great sites to visit along the way such as Indian Pictographs and a couple arches including the massive Slipper Arch. This is a good family ride, but portions of Devil's Racetrack are quite difficult and rough and will be a challenge. Along with the difficult sections of Devil's Racetrack you must also negotiate Fixit Pass. 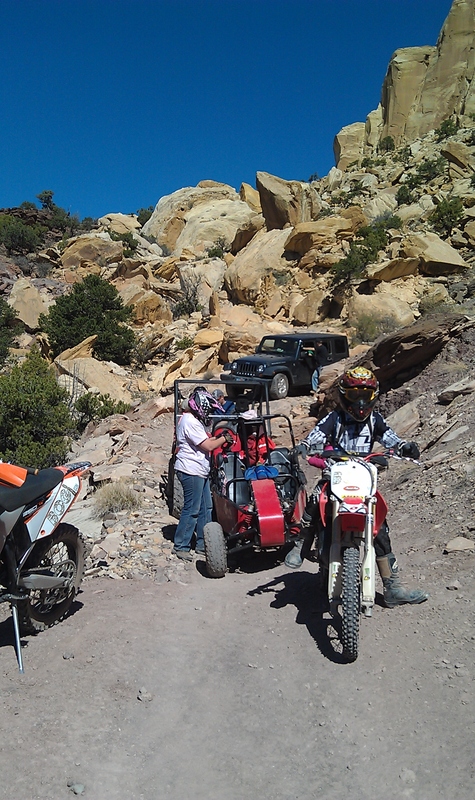 As seen on the video, a narrow & short wheelbase of a side by side, 4 wheeler or even a dirt bike can make weaving through the rocks a bit easier unless you have the clearance to drive straight through as we did years ago in our rock buggy. You can do this loop in either direction, but we have always gone counter clockwise. From the trail head designated by the flag on the map below we crossed under the freeway and veered right to begin our ride. 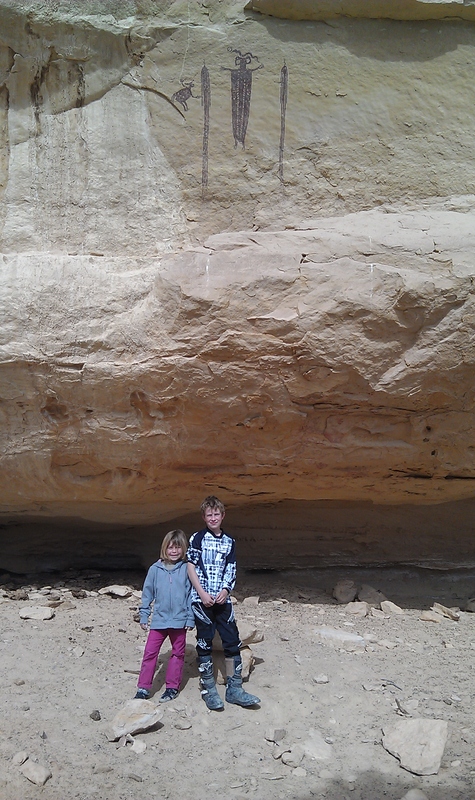 After traveling a mile or two, we decided to stop at the Indian Pictographs that are just a short distance off the main trail. Two spurs to the left lead to two different sites to view the pictographs. There are fences, but there is a walkway for foot traffic to get in. Not too long after visiting the pictographs, the main trail begins. It doesn't take long to get to a rough decent to welcome you to the trail. After the first rough decent however, it mellows out and we could focus more on the scenery as we traveled through the Swell. The trial is fairly easy to follow as you just stay on the well traveled road. Pay attention however as you reach Cane Wash approx 6 miles from where the trail begins, 8.5 miles total. In the wash there is a junction between trail 643(cane wash) and 638. Stay left on 638 which will shortly climb to the right out of the wash. From here it is another 4.5 miles approximately to Fixit Pass. About halfway between Cane Wash and Fixit Pass is a sign with a map and a small place to pull off where we stopped for a snack and a breather. It's a quick ride to Fixit Pass from here where the fun really begins. Careful navigation is key here to avoid getting hung up or getting off balance. We made it through with the bikes fairly easily with only a small fall from one of the younger riders. The side by sides were able to scoot around quite easily and avoid the big rocks as well. The jeep however was a bit more of a challenge. Although the Rubicon was set up with lockers and quite capable, the longer wheelbase and lower stance demanded more work to get it through. After negotiating Fixit Pass we dropped into North Coal Wash. It's hard to miss Slipper Arch along this wash on the right. This is an excellent place to stop for lunch and is exactly where we stopped. Slipper Arch seems like a good halfway point, but Devil's Racetrack does take some time, so don't linger too long. 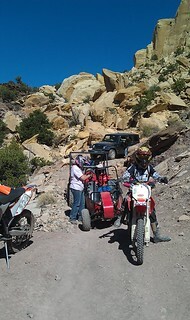 A few miles down the wash past Slipper Arch is the signed turn off to Devil's Racetrack. 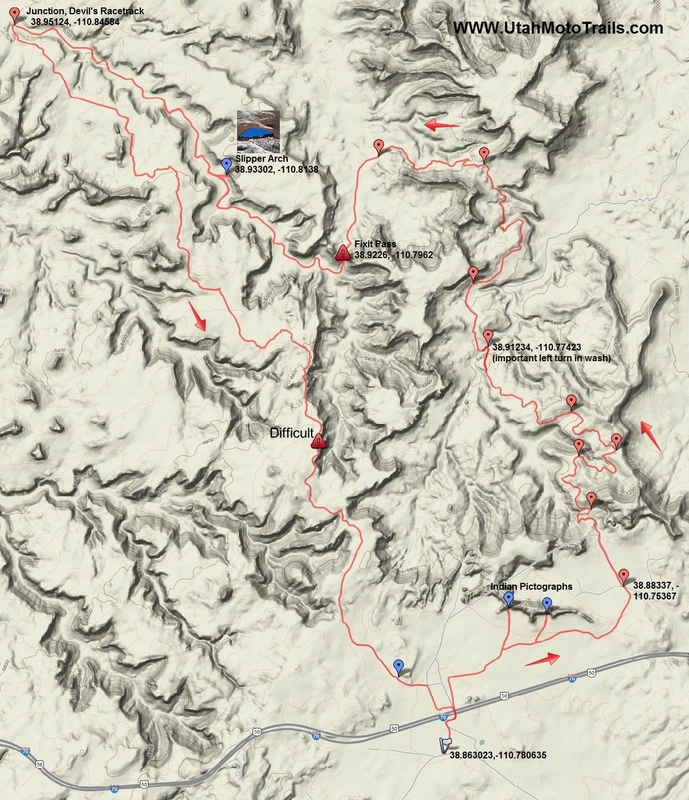 The trail turns sharply to the South/East and begins to head up and back towards the highway. From here it is a little over 10 miles on trail 641(Devil's Racetrack) to the highway. Time to complete this section can vary greatly depending on the type of rig you are in and how fast you are willing or able to go. 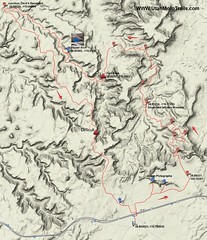 The roughest "step" portion of the trail is designated on the map. You'll know you are there when you see the fencing and because you will be close to the edge of the cliff. My boys made this part look easy. Again, the jeep and 4 wheeled vehicles took a little more time, but got through without incident. Upon reaching the end of the rough stuff, there is a sign to signal the end(or beginning) of the Devil's Racetrack. A short distance beyond this off to the right is Dutchman Arch. We didn't stop because we were running late, but it's a fun place to stop and let the kids climb a bit. From here it's back under the highway to where you started. click for Directions to the trail head from your location, see the map below for route information. To reach this area you must exit on exit 131 from I-70 and head West towards Head of Sinbad on the South side of I-70. and Swasey's Cabin. Follow the signs to Head of Sinbad and/or Swasey Cabin. There are many places to camp along the way that are easy to spot. Be aware that the time taken to travel this trail can vary greatly based on the group size and makeup/skill of the group. Working through Fixit Pass and some of Devil's Racetrack can take time and compounds with group size. 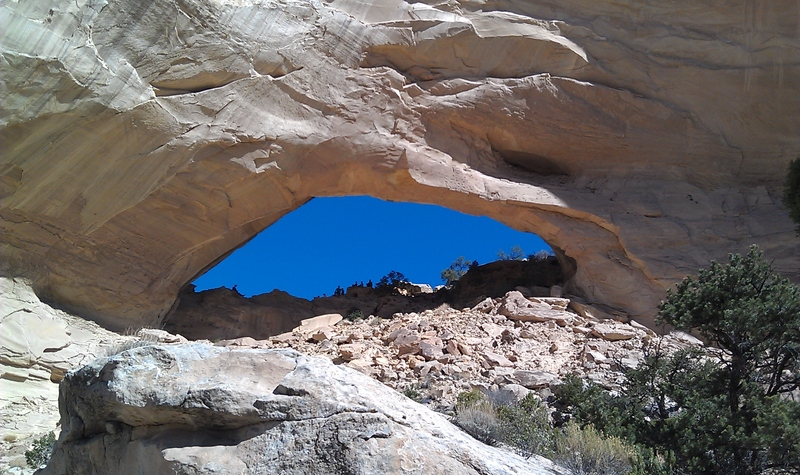 If you choose to linger at Slipper Arch or the Pictographs, this will also add time so plan accordingly. Great trail report. Can you tell me where the campsite is located shown in the "Camp" photo?